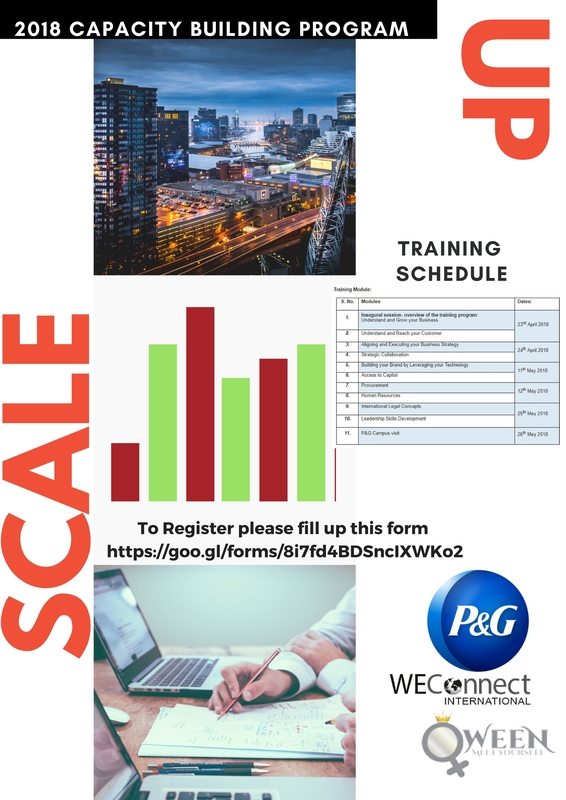 Free Capacity Building Program by WeConnect International & Proctor & Gamble India! P&G India, in partnership with WEConnect International, is pleased to announce the commencement of a capacity building program for women business owners. P&G India’s objective is to expand its supplier diversity and inclusion program, which includes efforts to source from more women-owned businesses in its value chains. WEConnect International is a non-profit that certifies and trains women-owned businesses globally while providing opportunities for market access. This capacity building program will cover various technical aspects for growing business ventures and will take place over a span of two months in spring 2018, followed by a graduation ceremony to mark the successful completion of the course. This application is open to all Indian women business owners fulfilling the below mentioned criteria. Facilities- Housekeeping, Office Stationary, Corporate gifting etc. Applicants may preferably be located in and around Mumbai region, since this is a non-residential training program. However applicants from other cities are also encouraged to apply if they would be able to attend all of the modules on the given dates at Mumbai. Applications are open until 5th January 2017. Please request you member to visit https://goo.gl/forms/8i7fd4BDSncIXWKo2 to complete the online application process.